1.New design, wholeheartedly for the world’s mother and baby services, so that my mother relaxed, baby comfortable, happy and happy to learn to go! 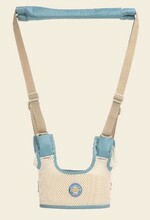 2.Excellent selection, reasonable design, so that your baby more comfortable. 1. Recommended hand washing, do not use the washing machine and dryer, so as not to damage! 2. Do not use bleach! 3. Please use 30 ° C water cleaning to ensure shape! 4. Please wash it alone! shipping 23 jam commodity detail: high glittered rhythm.